I love when people have style. And of all the people I know, Beth FS and her mom and sister are the most stylish. They know how to put a look together, and always top it off with beautifully polished nails, perfect makeup, and good hair. They are genetically blessed, and aesthetically talented. So, it shouldn’t have been a big surprise when Beth FS’s little sister’s wedding was the most stylish wedding I have ever been to. Her sister had a look she wanted to achieve, and she exceeded all of my expectations. When the doors to the back of the church opened, and everyone caught their first glimpse of the bride, there was an audible gasp. You see, she is even MORE beautiful on the inside. It will be hard for you to believe that when you see this picture, and see how beautiful she is on the outside. But, trust me, it’s true. 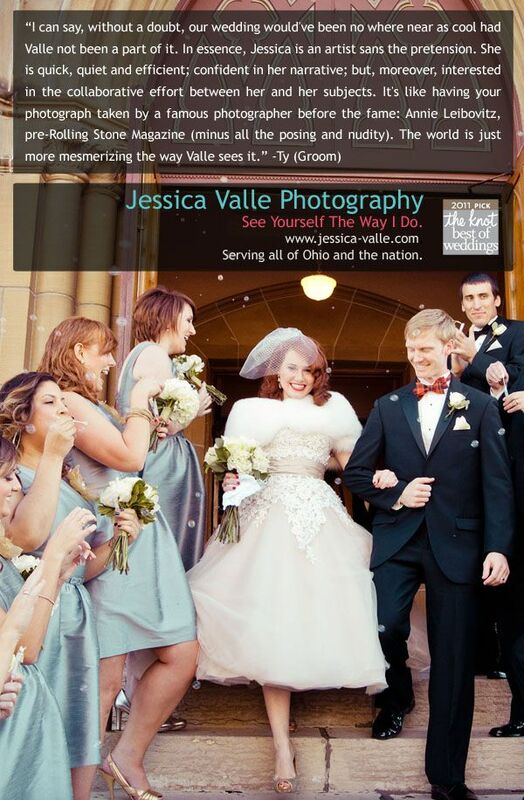 Her photographer is an immensely talented girl named Jessica Valle. It’s weird, I had started reading blogs several years ago, and I came across Jessica’s. I have watched her grow over the years as she became a photographer, and then as a complete coincidence, Beth FS’s little sister met her, and she became her friend and her photographer. Small world. I hope you all had a good week. My week has been SOO busy. I worked Monday, had a meeting after school, started working on report cards, drove to Indianapolis for a conference…and that was only Monday! Today I had school all day, then parent teacher conferences until 7:30. I am glad that it’s all over, and tomorrow is just an inservice day, so I get to sleep in a bit. You have a beautiful way of expressing yourself so proud! They are seriously stylish! Some people just have “it” don’t you think? I LOVE this picture. Amazing!!! Lauren was an amazingly beautiful bride! !